Good news... 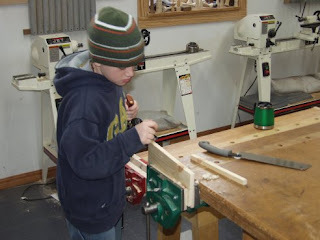 I was invited to write a series of articles about wood working with kids for the Fine Woodworking website. They will provide links to this blog and also to the Clear Spring School, so we will get to share what we are doing with a wider audience. I am very excited about the possibility that lots of people, both in and out of schools will renew our national interest in making beautiful things from wood. We are maybe over a month from these articles making their first appearance. I have writing to do and then the editors will do their work. The editor from Fine Woodworking also gave me some interesting news. The first chapter of my new book Basic Box Making has been made available on the Fine Woodworking website. In the first few hours of it being available, the high demand for downloads overloaded the Fine Woodworking server, causing it to crash. 40,000 downloads. They didn't anticipate such a high demand. I hope that all were pleased with what they saw and chose to buy the book. The server is fixed now. If you would like a copy, follow this link.They plan to do something similar in the future with my new DVD. Years ago, I was profoundly affected by the Whole Earth Catalog which was a bible of sorts for a new age. The new age never quite arrived, as those who read the thing and were inspired by the thing succumbed in time to the same mindless consumerism that was driving the rest of the country. The Whole Earth Catalog idea was to put tools and information in people's hands to incite a renewal of productivity and creativity along lines of environmental sustainability and responsibility. Looking for a good shovel? 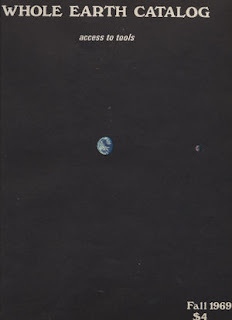 The Whole Earth Catalog would tell you where to find the best. Today, and in fact, nearly every day, the woodworking tool catalogs fill my mailbox. I find a few good things in them, and sometimes buy a thing or two. If I were to buy much more, I don't know where I would put things. There are new gadgets for every purpose in the woodshop. You would think in reviewing the catalogs, that woodworking was more about having the right stuff than about making the right things. We are a toy consuming conglomerate. Toys are engineered for children to take the guess work and creativity away. All the manipulations are precreated by the designers, leaving little to the children's imaginations to discover on their own. Woodworking tools are just the same, just noisier and more expensive. To meet the woodworker's hopes for effortless success, the tools are designed to take away risk of mis-cuts, mis-measurements, and various other kinds of "mistakes", leaving the process uncreative, less challenging and unfulfilling. I have heard tool companies and tool sellers and even publishers complain about the industry being flat. I can remember a time when woodworking was about much more than shopping for new tools designed to take the place of skill and attention. If you don't mind, I'll tell you about it. It involves a rather pretentious concept, that at its core isn't pretentious at all. I call it the Wisdom of the Hands. It is kind of a corny notion. Like those of being skilled at something and caring about results. It may be impossible for most to imagine what it would be like to live surrounded by objects made with love and full engagement of human attention. We live surrounded, or even overwhelmed by objects produced by machines that lose our interest in a matter of days or weeks, then fill our closets and then landfills. There are no feelings involved in the making of these things. We may be lured to acquire them by our fascination with the new. A very normal human desire is to own and possess. We may find pleasure when these objects get noticed by our friends. But once they have gained brief notice, their value plummets. There is another very normal human desire that involves the hand. At one time anthropologists wondered whether to call us Homo Farber rather than Homo Sapien. We are makers by birth and instinct. It is in our genes. It is vital to our being. To ignore our children's impulse to create is to deprive them of fundamental values and experience. 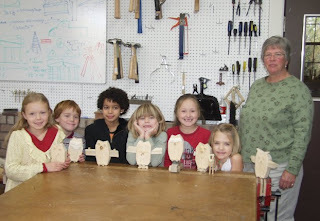 The photo above is of Clear Spring School students making baby owls from the book Hoots & Toots & Hairy Brutes. I went to see the present-ation tonight about global warming and climate change, and I was dis-appointed that it gave almost no information on how we can change our lives to lessen our impact on the planet. In fact, it was mentioned that Walmart was stepping up as a leader in the movement to cut emissions. I have a very difficult time seeing how a company whose profits are based on the mass consumption of highly destructive and wasteful products will be able to do what is right for the environment. It reminds me of the "Buy American" campaign that Walmart ran about 10 years ago. The pressures they put on American companies stripped them of profits and sent most of their manufacturing overseas. So the "Buy American" campaign quietly disappeared in the black hole of ineffectual and distorted advertising. Anyway, I will have hopes. They spring eternal. The challenge we face is enormous. Reducing carbon emissions will require each of us to change our lifestyles, buying habits, travel plans, home sizes and on the plus side of the equasion may lead us to live more consciously and with higher purpose than that of being mindless consumers in the huge destructive wheel of mass merchandising. Maybe we will even get to where we enjoy making things for ourselves that last for generations, and that give profound pleasure in the making, the having and the using. My Great Aunt Allene was a retired school teacher who collected antiques enough to furnish the homes of all her nieces and nephews. The bed I slept in as a child, and the secretary that served as my desk during high school were both left to my family by Aunt Allene. Growing up in a household of antiques gave me the idea that woodworking could be done in such a way as to last and serve with beauty for generations. Within that notion is the seed of renewal for our culture. If we were to carefully choose items to last a lifetime, or make them ourselves to last a lifetime, we would turn the tide. Walmart might not like it. Those who monitor our very gross national product might not like it. But our planet would rejoice. The photo above is of 1st and 2nd graders at Clear Spring School. I woke up in the night and looked out at the night sky. The tall forest trees were standing stark and bare in the glare of the cold moon. I wondered for a moment if there were others looking out at such a sight. I ask how we are to adjust our lives to live in greater harmony with the earth and its resources, when we live so isolated from it...not feeling its heat or cold except when we move from the comfort of our homes to the comfort of our cars to the comfort of our offices and then home...not seeing its beauty or knowing its wonder. Thousands of generations of our human kind lived in adaptation to nature and in harmony with it. Thousands of generations left hardly a mark on our planetary resources. Tonight at the Eureka Springs Library, we have a presentation by one of the 1000 people trained by Al Gore to bring the message of challenge and hope that we can live in greater harmony and responsibility with the earth. It is a daunting task. Even making a few small changes that lessen our comfort and bring us to a vision of the cold night sky involve risk and effort and change in consciousness. 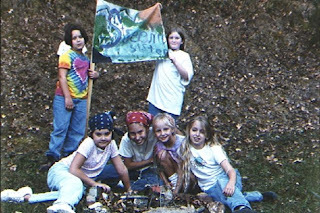 At Clear Spring School, we have a camping program for students from 1st grade through 6th. 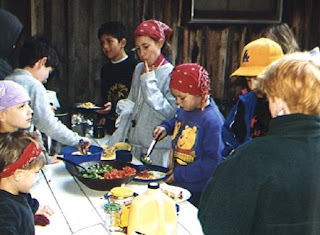 Twice each year, our students brave the night sky, sit around campfires, run in the woods, sleep in tents, tackle the unexpected, prepare their own food at campfires, and learn about the ways all our ancestors lived and about how some on our small planet still live. A few days in the woods may not seem enough, but it is something all our children need if we are ever to live in greater harmony with earth. 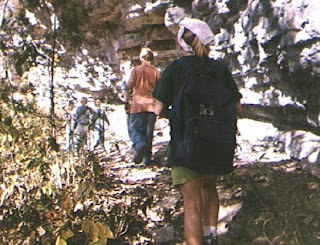 The photos above, at left and below are of a Clear Spring School Campout. The photo at the top shows a patrol group with their flag. The patrol group concept presents great opportunity for the children to learn democratic leadership skills. The world is our classroom. I am nervously waiting for awhile at home before going to the benefit-reception for the Wisdom of the Hands program at Clear Spring School. I am feeling nervous because there is actually so much to say about the hands, that it is hard to narrow down what will be most useful to those coming to the event. For those who've given little thought to hands-on education, the challenge is to carry them each around the corner to look at their own learning through the lens that their own hands will provide. The reception is being held in the new home of very dear friends. Back in the 80's and 90's, I made a number of pieces of large furniture for their home, which will all be on display. They are timeless, showing no wear, reflecting the loving care that they have been given for decades. Besides the tour of the Nelson home, furniture made by me, works by my students, wonderful food and wine, valet parking, a running digital slide show and door prizes made by students at Clear Spring School, we have two workbenches and a lathe set up to give the guests a brief taste of being in Clear Spring School, and the wonders that their own hands can bring when engaged creatively in education. Come back tonight or tomorrow. I will have photos to share. OK, the party's over. I got over being nervous and delivered my 15 minute talk in about 35or 40 minutes to about 30 people. What a nice crowd. 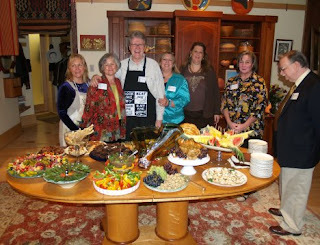 I thought as a photo of the event, you might enjoy seeing the cooks, the food on the birdseye maple table I made in about 1988 and the cherry cabinets (at rear) that I made in 1985. The food was almost too beautiful to eat. One of the things you will notice if you read very much in this blog is the participation of our teachers at Clear Spring School. The Wisdom of the Hands program would not be a success without them. You will see pictures of them helping in the woodshop and doing their own work alongside the students at all grade levels. Our teachers get excited about our projects. Many times, they come to me with ideas, wondering, "can we do this?" My assistant and I figure out ways, plan the materials, sometimes scratch our heads awhile and then do our best to deliver. Sometimes things don't work out just as we planned. It is good (actually great) for students to know that things don't always work as intended. We are honest about our mistakes. 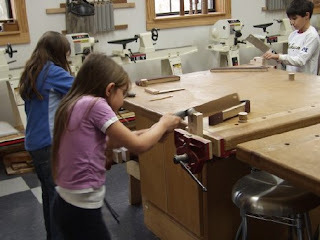 When I was in Sweden last May, one of the Sloyd teachers at the conference expressed concern that a woodworking program that bends over backwards to serve the rest of the curriculum would be considered less important in the school. If you take a walk through the Clear Spring School campus, I am very pleased to say that evidence of student woodworking is present in every classroom, in the library and in every office. Every child has a collection of his or her own woodworks, each piece offering remembrance of lessons learned and enjoyed. The rather fuzzy photo above is of Jessica Fitzpatrick. She teaches Spanish and Math at Clear Spring and as you can see learned to plane wood last week-by hand. She also just received her Masters degree in Education from Goddard College. Two very nice things to have happen in just one week! Congratulations Jessica! Fifth and 6th grade students at Clear Spring have been studying Canada as part of their current project in North American Geography. We worked on clocks in the shape of maple leaves with the colors from the Canadian Flag. 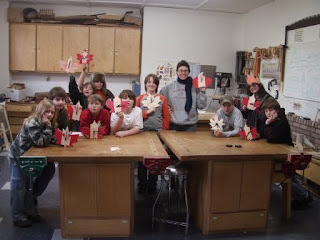 The students used cut paper to make templates for scroll sawing 1/4" Baltic birch plywood to shape. They used woodburners to do the lettering and then used markers to apply the red color. 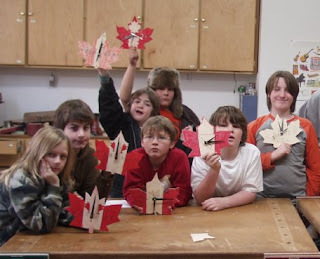 Some of the clocks were intricately decorated, and since the teacher Andrea had a Maple leaf clock from when we did the project two years ago, she made her clock as a map of Canada, with all the small islands outlined with the wood burner. Real objects often provide better remembrance of learning than written notes. Kurtis said as he left the woodshop, "Now I will have a clock in my room!" Next week we start making pyramid boxes shaped like the stepped pyramids made by the Mayans in Mexico. 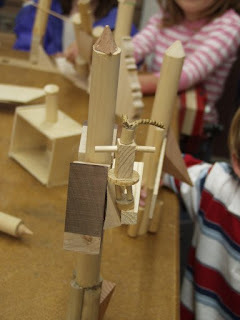 Today in the 3rd and 4th grade woodshop, the students worked on rocket ships as part of their study of space. They love taking scrapwood and seeing what they can make of odd shapes. I'll have photos of their finished work next week. 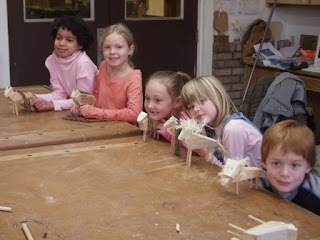 The first and second grade students finished making model farm animals as part of their study of farms. All the girls wanted to make horses, and Noah was insistent that he wanted to make a lion. When we were trying to agree what animals were to be made, the girls all voted for horses, and Noah said that the thing he didn't like about democracy was having to go along with the majority all the time. With a small class we could be flexible. 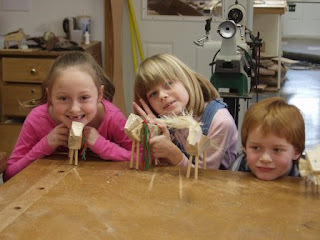 The parts of the bodies were cut from 2"x 4"s, and the legs were made from 5/16" dowels. The manes and tails on the horses and lion were made from yarn and twine. The photo above is of Clare, Jade and Noah. Noah's lion is at far right. On Saturday January 27, we are having a benefit reception for the Wisdom of the Hands program. It has been supported by a private foundation since the fall of 2001, and that foundation has reduced its support for the current year with the request that we secure support from others. I will be very busy for the next few days with not much chance to write for the blog. I hope to keep you coming back by providing links to some interesting reading. Matthew B. Crawford wrote a piece for the New Atlantis, Shop Class as Soulcraft, that is enlightening and worth reading over and over. It was first sent to me by an old friend Reuben Rajala and again today by a new friend, Ethan Sanford. I hope you enjoy it and keep coming back. Clear Spring School is a 501-C3 tax exempt charitable organization. Please write Wisdom of the Hands in the memo. At crafts shows, people tell me while they are looking at one of my inlaid or carved boxes: "I don't have enough patience for that." I thank them knowing they've offered a compliment, but lack of patience is an excuse I don't believe. People actually have patience for different things. I have no patience for shopping, or driving in heavy traffic. I have no patience for network television. Put a chisel in my hand and I can be busy for hours. If you have money, you can hire people to do things for you. There will be times when they may not be available but with patience and enough money they will come. If you have skill, you can do things for yourself, find satisfaction and savings in your own activities, and get things done at your own convenience rather than waiting patiently for someone else to come. You will discover new skills in what you do and find something to be proud of in your work. What people often call lack of patience really describes the following: lack of interest, lack of motivation, lack of confidence, lack of experience and lack of skill. It is ironic that our society places knowledge above skill in the social order. The carved basswood box above is to be featured in an article in Woodwork Magazine. Tie a string around your finger. For those whose thoughts circle endlessly inside their heads, mired in incessant internal dialog, incapable of decision or action, it is good to remember the potential of hands to bring change and resolution. The ages old technique of a string around the finger may help to keep hands in conscious consideration. It may be good to watch the feet as well. We think of intelligence being lodged within our brains, and overlook the wisdom and intelligence present in our hands, feet and hearts. Today's excercise: Sit with a friend in conversation. Be attentive to both the voice and the hands. You will note that the gestures when observed are as expressive as the words and tone of voice. In fact, if you can give your full attention to the bodily presence of your companion instead of allowing his or her words to trigger incessant dialog inside your own mind, you may begin to see wisdom and intelligence in a new light. I know some of the few readers of this blog will look at what I say as an anti-intellectual rant, but to be mired in the intellectual framework is to ignore so much of the reality of our own beings. To be stuck is a state of being that deserves a shove or at least a nudge. 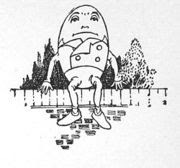 It is the old Humpty Dumpty thing. We know that the king's men really can't do much about it. They're the King's Men. They know very little about their hands. But falling off the self-created wall of intellect can be a good thing. Especially when there are skilled hands available to catch you or at least help glue the pieces back together. What about the hands? If you were to walk the campus at Yale University in NewHaven, CT. You would see one of the most beautiful university campuses in the US with some of the most beautiful cut stone architecture in the world. You would watch students pass through gates, oblivious to the intricacies of stone masonry, oblivious to the efforts required to learn the trade, and equally oblivious to the huge contributions made to their institution by the working class. In essense, a walk through the campus explains a lot about American politics. It explains the arrogance of George W. Bush. It explains how John Kerry could be out of touch. Where the hands are not engaged in the development of intelligence, there is little wisdom. If I were president of Yale University, I would ask that every incoming freshman spend a week in the quarries, develop blisters from the labor and learn to recognize the marks of each tool used in the carving of stone. Students would cast aside the arrogance of the ivory tower, and develop respect for the dignity of craftsmanship. Some might even find pleasure in it. We would become a wiser and more humane nation as a result. Freidrich Froebel (April 21, 1782 – June 21, 1852) could rightly be called the father of holistic education as well as being the inventor of Kindergarten.The following is from Froebel and Education through Self-Activity, H. Courtright Bowen, M.A. Charles Scribner's Sons, New York 1897. "...to the young child, as to primitive man, all knowledge does, as a matter of fact, come as one whole ...the subdivisions into subjects and departments is a very gradually evolved plan, for the most part wholly artificial and only adopted for the sake of convenience...the very nature of knowledge itself teaches the necessity of connectedness. Facts in isolation, and unrelated to one another do not form knowledge. Facts have to be compared, classified, organized, connected, before they become what we call knowledge...since education has largely to do with inducing the right acquirement of knowledge and the right use of knowledge, the task of the educator must largely consist in making clear and maintaining the connectedness of facts and things." But for Froebel, the acquisition or assimilation of knowledge was only one part of the educational balance. The other part was "doing" or "giving out." "...observation and discovery are not enough for our purpose--especially in the earlier years. Something must be added to them--something which renders more of the human being active, and which has to do with giving out or expression...this work, ...doing, will call into activity more of the mind; will require the co-operation of some of the physical powers; readily takes the form of giving outward definite expression to ideas and mental images; and it is easily united to observation and discovery, and is immensely improved by being so united. This making of new forms and combinations (rising from the merest imitation of models up to the most original inventions), this giving of definite expression to ideas and mental images, ...is the great Froebelian doctrine of creativeness. It is the pactical application of the priniciple of self activity, and together with (Froebel's) doctrines of continuity and connectedness, it forms the heart of Froebel's system." 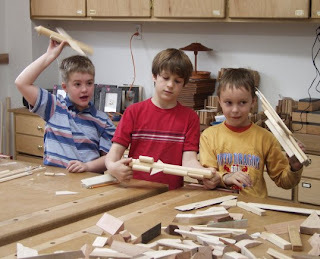 I think you can probably understand from this, how an activity like woodworking in schools (or outside of school) can fit a system of education. Having the school resources to bring abstract knowledge to concrete exploration and expression are essential to the development of each child. The photo above is of Froebel's grave monument which was built in the shape of his second "gift." French Philosopher Jean Jacques Rousseau said in his book Emile, "put a young man in a woodshop, his hands will work to the benefit of his brain. He will become a philosopher while thinking himself only a craftsman." Was he kidding? What in the heck could working with your hands have to do with philosophy? There is the old story of the three philosophers who went for a walk on a starry night. As they walked along contemplating the majesty of the universe, they fell headlong into a drainage ditch. Whether or not they learned anything from the experience is not yet known. If you were to read and understand the works of George Lakoff and Mark Johnson about the "embodied mind", you might realize that the thousands of years of philosophic thought that attempted to look beyond our physical reality was locked in a descriptive framework completely dependent on the observers' physical reality. Talk about a "catch 22!" In order to attempt to understand abstract reality(isn't that an odd concept? ), we are deeply, fully, and totally dependent on the metaphors drawn from our physical existence. The craftsman, immersed in intimate study of the physical nature of the material, of the tools reflecting the deep working knowledge passed on through generations, and of the dynamics of his or her own body and hands, as they give new shape and proportion to wood, is well positioned for thoughtful analysis of the fundamental principles of life. We have this tragic notion in today's society that those who work with their hands are in some way lesser in significance or importance than those whose work is of the intellect alone. The three philosophers seem to be charting our course. The way things are going in our schools, government and society, we'd best pray that the ditch is shallow and dry, or at least that the water in it may be warm. Engage your intellect through the activities of your hands and heart if you would like your life to have deeper meaning. Crisp edges on furniture feel sharp to the touch, and are vulnerable to nicks and dings, so most craftsmen use routers to shape edges to a softer profile. The roundover edge is one of the most popular. In fact, at this point, it has become so popular that you may be looking for something different. A small chamfer is a great choice. It provides an edge less vulnerable to wear and occasional bumps. 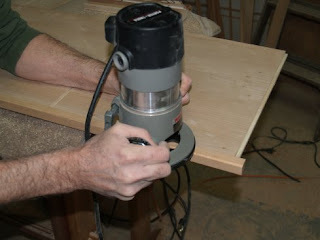 It can also be cut with either hand tools or router. I like the way the three distinct surfaces of a chamfered edge catch and reflect light, but this is an effect that can be lost through excessive sanding. Power sanding will ruin the effect at the slightest touch, so sand by hand with a sanding block to get the best results. 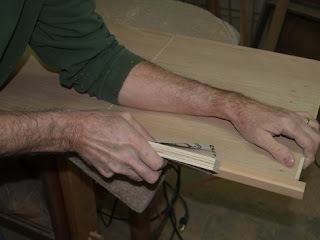 If using a router, it will work best and save time in sanding if you sand the edge of the stock first. Minor surface variations in the edge of the stock, create minor variations in the routed edge as the bearing follows the uneven surface. The amount of time spent sanding those routed surfaces will lead to loss of the fine detail a chamfered edge provides. The three photos that follow show the process. Photo 1. Use a sanding block to sand the edge smooth in preparation for routing. Photo 2. 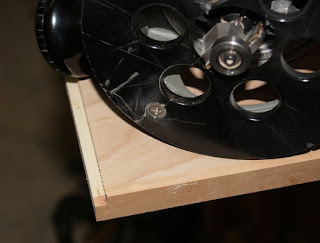 Rout the edge with the router moving from the right to the left to prevent edges from splintering. This is called a "climb-feed," but is perfectly safe with both hands on the handles of the router. Photo 3. 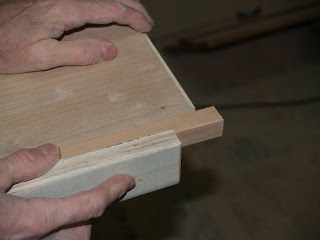 Hold the sanding block at a 45 degree angle and stroke along the edge. I think you will be pleased with the results. As current President of the National Associa-tion of Home Workshop Writers, I can’t help but reflect on the positive role how-to writers play in modern life. This was written as a letter to our members. Do you ever feel like the DVD of your own life is spinning in its slot, the drive is on fast forward and your own remote is in the hands of others? Let’s push the pause button for just a few moments and reflect on our own small community of writers. Can you imagine what visitors to a museum would think if they had never had a chance to make anything? Would they look at the real Mona Lisa and marvel at brush strokes made by the human hand? If they’ve never held a brush, have only engaged the world through a mouse and keyboard, will they have the power in their own souls to connect with the vast human legacy that only clicks-in when there is texture, the warmth of the human touch, and a sense of one’s own power to create? The first is that we as a small community of how-to writers must come to an understanding of the powers that lay in our own hands. We, more than most, know the wonders of our own creativity. We, more than most know the forces and means inherent in the human soul to improve the reality of the day to day and the here and now. Let’s acknowledge the incredible value of who we are and what we really do. We empower. In the face of a consumer culture with the masses driven to consume, WE inform and instruct: how-to, why-to, encouraging others to build and make better. Perhaps some of us may feel enticed by the unrelenting forces of fantasy and distraction to write the great novel instead, but perhaps we should remember there is no more important calling for today’s age than that of the how-to writer. The second thing to consider while we are still on pause is the strength we are can give to the future. Knowing the importance of our own hands, the feelings invoked in our own hearts by our creative efforts, let’s stand resolute in our support for hands-on education in all our nations schools and for all our nations children. Let’s think of ways to expand what we have started. With the help of Vaughan and Bushnell Manufacturing we started a tools for schools program. How about tools in ALL schools? Can we do more to spread the hands-on education resolution? Let’s consider new things, too! Let’s put our collective wisdom and power to work. 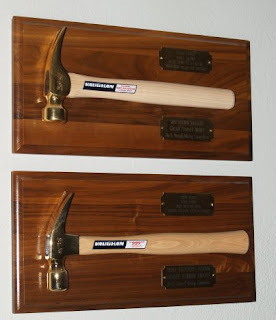 The photo above is of my two "Golden Hammer" first place awards for how-to writing, awarded by the National Association of Home Workshop Writers. Information on this year's writing competition can be found on our website nahww.org. The photo sequence at left was taken in one of today's classes at Clear Spring School and is of making a sloyd plant stand or trivet based on designs from Gustaf Larsson's book Elementary Sloyd and Whittling. The project is done entirely with hand tools except that it begins with white pine planed to a 5/8" thickness. 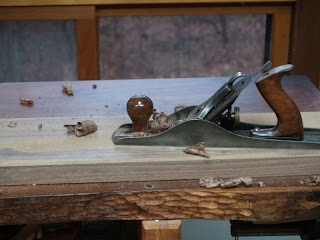 The student uses a marking gauge to scribe the cut line on the stock as shown in the first photo, then rip saws the parts slightly oversize as shown in the second. 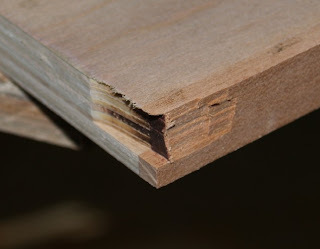 Each time a cut is made, the remaining stock has to be re-planed straight and square as shown in the third photo before the next part is rip sawn. The concluding work will be done next week. In geometry they say the shortest distance between two points is a straight line. If you think of those two points as being sequential, one being placed before the other, you can see that the line they form is a vector. It has movement. In the development of anything human, there is vector relationship, and we have a greater understanding of any point in time or space if we also know the path leading to that point. In Chinese philolosophy, they say that if you want to know how something is going to turn out, look at the origins, the intent and motivation of its beginning. I have a good friend Hank Kaminsky, an Arkansas sculptor. Our friendship goes back to my earliest days in Arkansas and he was my slightly-older-big-brother-mentor as I began my career in the arts. At the time we met, he was making sand-cast jewelry from bronze, and his old belt buckles are still very prized possessions among many of the early hippies who moved to Eureka Springs in the 1970s. As I knew Hank in those early years he went through a series of apprentices who would work for long enough to think they knew his methods, then break out on their own in competition. They didn't last for long. They lacked the vision and the sense of continuity, the "vector", that would have told them where to go next. 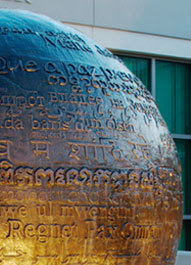 The image above is a detail photo of a large work by Hank Kaminsky Peace Prayer Fountain in Fayetteville, Arkansas. If we simply throw kids in front of computer screens without giving them a sense of the origins of our technology and the purpose of man's engagement in the physical world, I have to ask the question, "will they know where to go next?" He'll make the thing and the machine that makes it." Thank you Joe for your reflections and for the poem. I hope others will be willing to share in the same manner. I've been thinking lately of something that very few will remember. Back in the 1970's Chairman Mao challenged all the small communes in China to become backyard steel makers to resolve a serious supply shortage. The whole thing was an abysmal failure with huge quantities of useless pig iron being made from every piece of scrap in the country. Forests were burned as fuel, and even useful steel was fed into the ravenous mouths of the back yard smelters. These days, the thing is regarded as a joke. But for human beings nothing is wasted. Even the worst experience can hold the seed of future success. Links to the books Joe mentions are here: Success through Failure: The Paradox of Design by Henry Petroski... The Pencil: A History of Design and Circumstance by Henry Petroski. 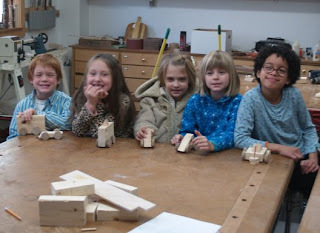 Today in the woodshop, the 3rd and 4th graders made model rocket ships as part of their study of space. I didn't have time to take photos today, so the images above and below were from two years ago. Ednah Anne Rich's book Paper Sloyd For the Primary Grades was published in 1905. 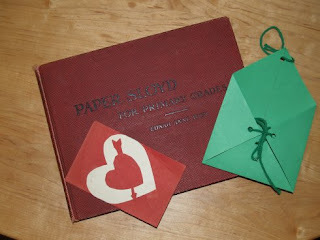 My copy came complete with the hand crafted valentine preserved between pages. The green envelope at right was made in my first and second grade woodworking class where we have been doing paper sloyd as a preparatory exercise in developing woodworking skills. These simple things made of paper are the kinds of things that most children don't do anymore. I want to review Otto Salomon's simple theory of Educational Sloyd for just a minute, and perhaps you will grasp on your own why children need to begin their education with scissors rather than with laptops. Education should: Move from the known to the unknown. Move from the easy to the more difficult. Move from the simple to the complex. Move from the concrete to the abstract. I am no Luddite. I use my Mac a lot. I do writing, accounting, photo editing, illustration and email on it. I use it daily in the writing and publication of this blog. I've even edited my own short videos. But children need to be tying knots, braiding string, cutting snowflakes and paper dolls and learning the full range of technology in order to understand its movement so they can anticipate its direction and be prepared to lead rather than follow or be pushed by the manipulations of others. There is a well-documented link between math skills and what is called spatial sense, described by the National Council of Teachers of Mathematics (NCTM) as “an intuitive feel for one’s surroundings and objects in them.” According to the NCTM’s Principles and Standards for School Mathematics, "Geometry and spatial sense are fundamental components of mathematics education. They offer ways to interpret and reflect on our physical environment through abstraction. They support creative thought in all mathematics"
According to the Standards, “spatial visualization includes building and manipulating mental representations of shapes, relationships, and transformations.” There is no better means than the transformation of paper from its original flat plane into three-dimensional carefully constructed useful objects through Paper Sloyd! For yesterday's post I wanted an image to show the baby in lap position for hand play with infants. To help me create the simple line drawing, I looked for images on an internet stock photo site that I could use to help compose the drawing below. 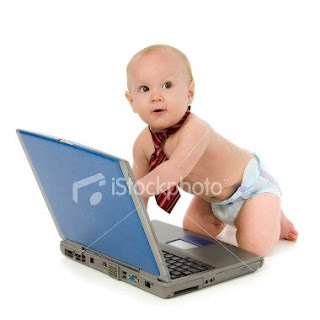 It is amazing what happens when you search in stock photo sites for the keywords infant and lap. I found photo after photo of the tiniest children sitting at laptop computers including the image from istockphoto.com shown above. Beginning with the hand play shown in yesterday's post, it is important to construct with your child a world of play and engagement. One of the things I find in teaching elementary school students is that they come to class with very little experience with scissors. They have a great deal of experience in play with toys of all kinds that can be manipulated in interesting ways predetermined by the toy maker. Computers are the same. They come with programs that allow predetermined manipulations. The kids get really fast in performing the manipulations, but never really understand the foundation of the technology. Scissors you can get. Scissors are made in such a way that you can fully comprehend the technology involved. So, why would this be important? Can't we just let our children bask in the wonders of our current level of technology? First, it is extremely lazy on our parts. We can sip Starbucks, knowing that our children are safely entertained, and not demanding the attention we would give only half-heartedly anyway because it would distract from our own distractions. If you are reading this while ignoring the children in your house, I'll ask you to go away and come back at nap time. Tomorrow, I will try to discuss the vector of development, what it is to be an artist, and why the very basic foundations of technology are important for all of us to understand. One last comment for today...we are spending billions of dollars to put computers in the hands of our children, but we're already shipping the computer jobs to India. We are investing our children's lives in a future for which they can't compete. In the meantime, we take such pride in seeing photos of our children sitting with their lap-tops, and miss the tragic irony that there are no real laps in sight. If you are looking at something and move to a different position you may see more clearly and perhaps see things that completely alter your understanding. 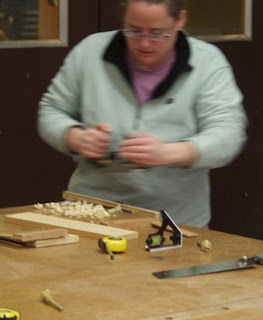 Years ago, when a friend pointed out to me that my "brains were in my hands," I was offered a different view of myself, that changed the way I looked at my own hands and offered me the insight leading to my career as a woodworker, author and teacher. I hope to do for others, what my friend did for me...provide a slight change in perspective into the frame of reference the hands provide. The simple drawing above illustrates the first position of play between parent and infant. I discovered when I held my own daughter in my lap in this position, the wonderful opportunity that we had for hand play. I was also reminded of watching my father and mother holding my little sisters in the same position. My father was deliberately engaged and totally attentive as though he realized the significance of this play for his children's development. Too often now, parents are distracted by other things rather than being engaged with their full attention on play. With your child in your lap, its head on your knees and feet on your chest, start by moving your hands into and out of visual range. Weave your fingers together and then pull them apart. Repeat and then vary your motions. Your child will watch and in a short time will engage your hands with hers or his. My daughter Lucy and I could spend what seemed like hours in contemplation of our hands. As she became a couple months older, toys and rattles joined with the hands, and we never tired of the play. We don't have any way to measure the profound impact such simple things can have except to observe the results. I could spend days as I suspect many parents might, proclaiming the wonders of my daughter. I won't. But I will invite you to play with your child in the manner I describe. Hold him or her as shown in the position above. Friedrich Froebel, inventor of Kindergarten realized the incredible opportunity young mothers were missing in the development of their childrens' capacities for learning. Much of his early work was in developing songs, hand activities and games for mothers to play with their children. We hope that schools will do enough to educate our children, but don't count on it. They can't make up for the opportunities lost in the earliest days. But take your child in your lap and with your hands make a start. There are very clear differences between an academic and a craftsman. While academics can spend their whole lives processing written material, a craftsman has to take what he or she has learned and make something practical of it...something directly useful to others. I don't intend this as a criticism of academia... at some point, after academic knowledge is laid on the table, every scholar hopes to see the object of his or her work put to use, benefitting people's lives or building a course of study for others to follow. We know a lot about the hands and how they directly impact our intellectual and cultural development. The story of our hands is told well in Frank Wilson's book, The Hand, and in a new book by Chip Walter, Thumbs, Toes and Tears. There's lots of research going on that confirms the hand's integral role in the development of intelligence. It is important for many of us to be aware of this research, but knowledge that doesn't lead to action is empty, null and void. My own background as a craftsman and how-to writer makes me concerned with practical applications that lead to results that can be shared with others working where the rubber meets the road...in families, classrooms and workshops. The real meaning of this blog, and the Wisdom of the Hands program at Clear Spring School isn't to accumulate information, but to encourage others to do something to engage our hands and our children's hands in learning. For the next few days, I want to share some concrete steps. Please tune in. 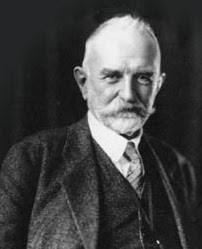 George Herbert Mead (February 27, 1863 – April 26, 1931) was an American philosopher, sociologist and psychologist, at the the University of Chicago. He is regarded as one of the founders of social psychology. He lived with William James as a tutor for his children while at Harvard, and studied with G. Stanley Hall and Wilhelm Wundt in Leipzig, Germany. 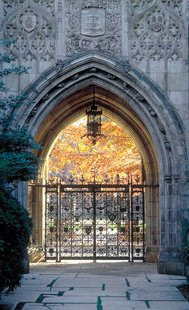 At the University of Chicago he was a colleague and close associate of John Dewey. One of his important contributions was an analysis of human activities, looking at the relationship between work, the making of art and play. The link that follows will carry you to his paper, "the Relation of Play to Education," originally presented as an address on the Chicago Commons, May 1, 1896. The paper itself is too long for anyone to slog through on a blog, but an important point is that play itself, has educational function in children's lives far greater than the imposed "work" taking place within classrooms. Whether in 1890, or 2007, classroom work has been designed to push students to pass (or fail) the tests required to move on to the next levels of education and to meet expected levels of state requirements. Play, as pointed out by Mead and many others has educational value far beyond what most in education are willing to acknowledge. While reading Mead's paper, be sure to note the comments about Mrs. Quincy Adams Shaw's School and about Sloyd. His comment about Sloyd carries particular insight. Mrs. Q. A. Shaw was the woman who brought Gustaf Larsson to Boston and founded the first Sloyd Teacher Training School in the US. You may have heard of the North Bennet Street School in Boston. It was founded by Mrs. Q.A. 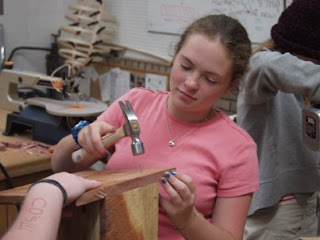 (Pauline Agassiz) Shaw and still serves as one of the premier woodworking schools in the US. The school to which Mead refers is one of the Frobellian Kindergartens Mrs. Shaw established in Boston. If you want to know more about Froebellian Kindergartens, please refer back to the December archive of this blog. Much earlier in the blog, I referred to a paper on play (.pdf download) from the American Academy of Pediatrics. Another great source of information is Alliance for Childhood. At their site you will notice that they and Sarah Lawrence College are co-sponsoring a workshop on play. Educational Sloyd...the student's choice? Two of my classes are finishing projects and and I asked what they wanted to do next. While they were wondering, I asked, "What about Sloyd?" "What's that they asked?" "That's where you learn hand-skills as a means of overall academic development." I gave them copies of my articles and showed them some of the most basic projects, thinking that perhaps they might consider them too simplistic and uncreative. Those were the charges that G. Stanley Hall made in his critic of Sloyd at the end of the 19th Century. Someday when I have a lot of time on my hands I'll embark on a very long, boring and detailed discussion of the psychologies of G. Stanley Hall and William James and their very different views of Educational Sloyd. To my great surprise, the students were excited about Sloyd. We'll see how things turn out. 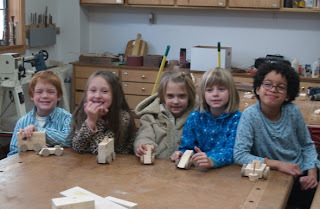 In the meantime, the 5th and 6th grades finished their toy cars in the woodshop this morning. My guest, Greg Mitchell, like nearly all the guests in the woodshop, worked on his own projects and assisted the students when they asked. Woodworking is actually such an engaging activity that it is hard to just sit on the sidelines and watch. Greg is a master in the making of rustic furniture, so it was wonderful having him as a guest. The photo above is of Greg helping Brendon. I grew up hearing stories about Bunny Lawrence, a friend of my father's from the period just before WWII. He quit college his first few days of school when he realized there was very little to learn from his professors in his chosen field of Engineering. He managed to find employment with IBM while he pursued his passion of rocketry with friends. Their break down rocket launch platform is in the air and space museum at the Smithsonian. It had to break down so they could load it into the trunk of the car to make a quick escape in case something blew up. Bunny was one of the early members of the American Rocket Society. My father was on leave in WWII before going overseas to Europe and spent a day with his friend Bunny who was working as a consultant on the B-25. At the time they were trying to solve problems in the de-icing of the wings. While the various engineers with all their specialties argued for mechanical solutions, electrical solutions, hydraulic solutions, etc., Bunny quickly developed an overview of all and laid out the multi-disciplinary solution required. Following WWII, Bunny was one of the founding partners in Reaction Motors Incorporated, a company formed to build rocket engines for some of the most important American space projects including the X-15 rocket plane. The technology they developed is still in use in the space shuttle. For some of that important work, Bunny Lawrence was presented the Goddard Award for Rocket Engineering. In 1964, Bunny became head of Chrysler Research Engineering where he worked on the development of the Lunar Lander. Bunny Lawrence's story was told to me by my father because it was important to him. It illustrated the limitations of over specialization and the opportunity that lay in the cracks between disciplines. The greatest leaps of insight and imagination don't happen in school, but in the interface between disciplines, when driven by passion to learn and create, we choose to ignore what we have been taught, the artificial constructs of human thought, and challenge life under the scrutiny of our own hands. Bunny, also known as Lovell Lawrence, Jr. died much too early of cancer at the age of 55 in 1971. You may also be interested in the history of RMI, Reaction Motors Incorporated. 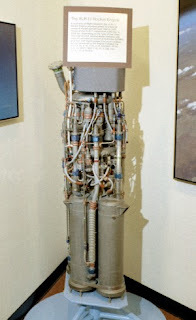 The photo above is of the XLR-11 engine built by RMI on display in the NASA Exchange gift store at Edwards Airforce Base. ...I was talking with a friend..his neighbor designed power dams, etc. They had a problem with some huge gates that would not close. As dozens of engineers stood by, one worked on closing them. Over the radio, someone asked "How much further do they need to go?" The engineer said "2 inches and 3 lines." I will repeat something that I've mentioned earlier in the blog: Manual training was started in American schools by Runkle at MIT and Woodward at Washington University because engineers of that day and age were lacking in basic skills...measuring, and spatial visualization. That was in 1870. It is amazing how much we think things change when in reality things are so much the same. We just keep growing fresh crops. My fifth and sixth grade students could have told the engineer that those were 3 sixteenths, not "lines." And I'm not sure about Reuben's distinction between theoretical folks and hands-on folks. What would happen if "theoretical folks" had some real hands-on experience like Runkle and Woodward intended? Occasionally someone makes it through the engineering profession with enough hands-on experience to illuminate the world. Tomorrow, I'll try to find time to tell about Bunny Lawrence. A great day in the woodshop! 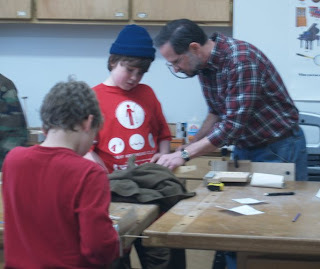 Rustic furniture maker Greg Mitchell from Fayetteville visited to observe classes. In the 3rd and 4th grades students worked on making toy cars with some work left to finish next week. The students in 1st and 2nd grades made cars, start to finish, but less complicated to make than those started by the older kids. 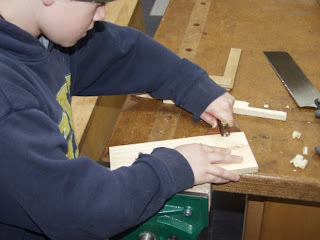 In the high school, some of the students had expressed an interest in doing some hand tool projects taken directly from early Educational Sloyd texts. 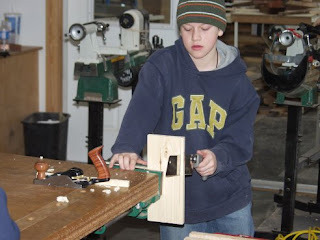 These old projects are a great way to begin learning about hand tools. So in high school classes, some were working on the lathe while others were busy with marking gauges, hand saws and planes to cut material to size for making objects that could be used as trivets or plant stands. They all got a good start at Sloyd. At one point, I looked up to see 15 students all working independently and safely on projects of their own choice. There are days for all teachers when things don't go just right. There are in fact days in which even the best teacher will be led to question his or her choice of careers. Thankfully, this was not one of those days. The photo above is of the first and second grade class from Clear Spring School with the toy cars they made. Yesterday, I wrote Baba Dioum in Senegal to thank him for his quote, and the wisdom it conveys. He wrote to me this morning and expressed his hopes of visiting the Henry Doorly Zoo where I was grateful to discover it. I hope he has the chance to do that. There is something about Africa that puts the hands in perspective. In the mind, all things are distant and removed. In the hand, all things are close to the heart. In the mind, we can rationalize conditions in a foreign continent. In the hand, we are either in service, or we are not. There is an article in this week's Time Magazine about Malaria in Africa, and the millions of children's lives lost each year, each of whom could be saved by the price of a cup of Starbucks coffee in your hand or mine. There are organizations to help. malarianomore.org is one. nothingbutnets.net is another. You may hold the Starbucks in one hand and the mouse in the other. Between the price of the Starbucks and the power in your mouse, you hold the life of a child in your hands.Click your mouse and use your credit card please. At nothingbutnets.net through the generosity of the Bill and Melinda Gates foundation, your contribution will be matched. You will save two for the price of one. Over 30 years ago when I was beginning my woodworking career, the diverse hardwoods of Arkansas were being sprayed with defoliants to allow faster growing and more profitable pines to become dominant. I realized that our hardwoods were being lost and neglected because so few knew either their beauty or their value. I came to realize that by making beautiful things, I could have a role in restoring an appreciation for our hardwood forests. More recently (about 10 years ago) I discovered a saying by Senegalese environmentalist Baba Dioum that puts in words the role that craftsmen like myself can play in awakening the world to an understanding of our precious resources. Woodworking is a means through which students and craftsmen can engage directly and positively with our natural environment. Our use of wood carries the responsibility to respect and preserve our natural resources. If done right, and if done with love, we become teachers, awakening others to understanding, love, and conservation. 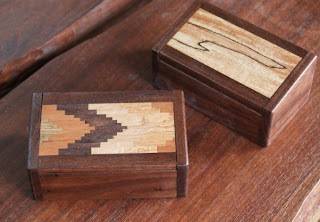 The small box at right in the photo below is inlaid with spalted maple, a wood whose patterns come from the natural processes of decay. The one at left has a patterned inlay which I make from a wide range of Arkansas hardwoods, illustrating the beauty, diversity and value of our forests. 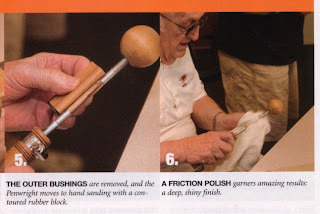 A common question that people ask when looking at crafts is "how long did it take to make that?" People want to be able to understand the object and its price in terms they can understand. Few people in today's society can understand from their own experience all the various elements involved in creating an object. The photo above is of the kinds of small boxes I've sold through craft fairs and galleries during my 30+ years as a craftsman. There is no way to explain the work in terms of time alone. The following is a woodturner's poem. How long does it take to make one of those? just ‘see’ the piece, (as if I could)? a crotch, an eye, or pearly curl? inventory, store, and dry it? glue, imbue with fill, or drill it? it’s stopped the warps, checks, cracks, once dried? (the goal: enhance, and don’t demolish)? how long’s that path, its way to wend? Or do you merely want to know how long it turned? This poem helps to explain the concept of finger blindness. If you have never had the opportunity to be involved in the making of objects from your own vision and creativity, the only way you will be able to relate to objects at all is in economic terms as in the question..."how long did it take to make it?" ...a question that seeks to place an object in an economic frame of reference from which the questioner can review the making of the object in the only context he or she may actually understand...dollars per hour. This poem also explains why all children need to have the opportunity to be involved in the arts and the process of making. We are finger-blind without it. 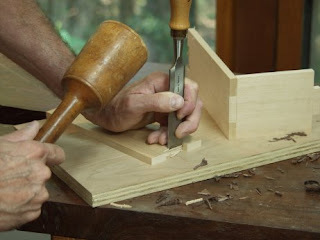 Before I get you thinking that wood-working is just kid stuff, I want to remind you that work with the hands can be contributory to the mental health of all, even the oldest among us. 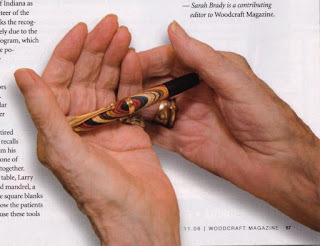 The November 2006 issue of Woodcraft had an article written by Sarah Brady about an interesting and important program for Alzheimer patients using pen crafting as a means to counteract the tragic effects of this debilitating disease, restore patient self-esteem and alleviate depression. Woodcraft has graciously provided a link so the article can be read on-line. The Hands of Altzheimers. I don't want to get you distracted from the immediate task at hand, that of engaging our children's hands in education. The article does help us to understand the incredible relationship between the hands and brain, and cues us to the significant role the hands play in the well-being of all. Because the hands work in seamless integration with thought, we are generally unconscious of their importance. I am here to remind you and to stir you to take notice and make whatever changes lead to a more meaningful life, for yourself and for those you love. Last year, I worked with Jack Grube, president of the New England Association of Woodworking Teachers to come up with the following list, 21 Reasons for the 21st Century which was distributed to High School administrators throughout New England. I would like to note that these same 21 reasons also apply at all grade levels. I seem to be one of very few to advocate woodworking in elementary school. A magazine editor recently asked me about the Wisdom of the Hands "movement." I told him, there is no "movement" as yet. The movement will come when some of the readers of this blog start doing something. 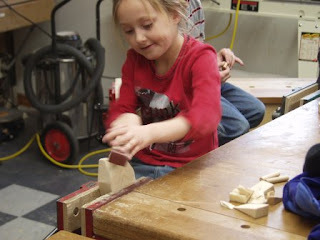 Invite your children or grandchildren to your woodshop. If you don't have a woodshop, buy some tools and start working first. If you aren't interested in woodworking, start in the kitchen or garden. Then armed with what your hands have given you, talk to the parents and teachers in your community about the role of the hands in learning. We know we will have a "movement" when tools are put in the hands of children and their hands are allowed to arise in service of knowledge and intelligence. 21. Is a class that students enjoy! like the saw I saw saw in Arkansas. A friend brought me a clipping saved for over 30 years from the Wasington Post. The photo above is a box from my new book, and was made from black walnut that had been around the block and captures some of the spirit that Mr. Fenyvesi describes. The hand forged iron pull is from Horton Brassses. There are worlds of difference between working with new lumber and wood that has seen years of service to man. New lumber has the smell of oak-moss, leaf-mold, and sometimes violets. Its smooth, uniform surfaces speak of the glorious technology of gang saws ripping through the knots and gnarls of a thick log. Old wood has a woodsy smell only when it is sawed. Then the heavy fragrances of rotting timber fallen long ago blend with the acrid odor, from the finish singed by the saw. There are also hints of the room once inhabited, as the blade unlocks secrets of a subterranean dampness or a wine spill. The raw, often dewy touch of new lumber awakens projects dormant in the files of the mind. It takes steady character--or lack of confidence--not to be overwhelmed by the infinity of ways in which the treasures of a lumberyard can be converted into shelves or picture frames, paneling or a cradle. All plans seem feasible when the saw makes its first cut and the blade bids the hand to follow. A project with second-hand lumber or cannibalized furniture means accepting limitations. Knotty pine or oak paneling rescued from a condemned house can be refinished or flipped around to make use of the side that once faced the wall. But the supply is limited, and the boards were cut to fit windows and doors, the fuse box and the furnace. The wreckers' pile is a mine of two-by-fours and two-by-sixes (They used to be one-fourth of an inch thicker and wider before the 1940's.) Made of yellow pine or Douglas fir, they can be converted into benches and sofas, mantles and dining tables. They have the substantiality of furniture built to last generations and to survive wars and revolutions. Stained dark, they evoke the grandeur of Spanish castles: left in their natural light shade, they suggest the taverns of Central Europe. New Lumber has not forgotten the green, growth of the forest. It has sticky resin--sometimes a pocket, sometimes a sheen--and juices which make it expand and contract, curl and cup, bow and warp. This youthful inconstancy can defeat the best plan and mock the skill of the most fastidious carpenter. Old lumber is resigned to a life of service to man, and it submits to his will and whim. 1t does not move, it does not change. It is stable and mature, accepting of the time and space found. But occasionally, an old board lets out a sigh that sounds like a whimper or a bullet's report. Finishing new wood means choosing from hundreds of stains. 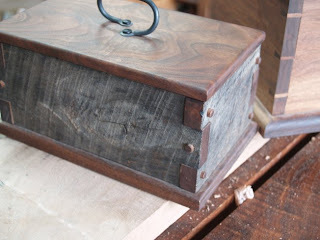 Plain pine can be made to look like rosewood; walnut can be turned into ebony. There are bleachers and darkeners. Varnishes do not seem like varnishes, liquid plastic that produces the effect of wood encased in glass. The scrutiny of sandpaper reveals the original shade of old wood. Boiled linseed oil mixed with turpentine cleans the pores and gives a golden glow. There is no need for special stains: umber rubbed in with another coat of linseed oil brings out the grain and underlines every whorl, check and nick. New wood looks like a topographical map. Old wood depicts history as well: coronations, civil strife and invasions. The ubiquitous nail holes have crowns, halos and lances that can be metallic russet or black. Discolored streaks and patches reveal where pictures once hung, the sunlight fell or the molding was. There are bruises and gashes, charred traces of cigarettes stamped out too late and tiny particles of ghostly chalk that seeped through from plaster boards into two-by-fours. Used lumber is an inheritance that usually goes unclaimed. It becomes one's own when it is turned into needed objects. The rehabilitation project is an adjustment; the start is where others left off. Fenyvesi was editor of the National Jewish Monthly, gardener, carpenter and essayist in 1976. A friend sent me this poem this morning. The photo is taken on my workbench of a Stanley No. 5 at work on walnut. We may be moving to an age in which wood becomes irrelevant except as a source of biomass for fuel and toilet paper. Can you imagine human beings living in such poverty of spirit? Can you imagine children growing up without the tools and processes through which generations past have discovered such beauty? Tool talk... One thing that comes up often in discussion with other wood-workers is whether hand-tools or power-tools are preferred. In my woodworking, I find that hand-tools when used to augment the accuracy of power-tools can increase both quality and efficiency . Here's an example. 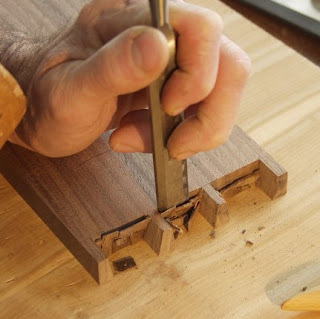 The first photo is of tear-out that often happens when the router bit has to remove fragile material at the end of the cut. In this particular instance, a great deal of care was taken in the feed direction and rate to avoid this event, and yet, as you can see, even with a skilled operator, use of the router can lead to disappointing results. 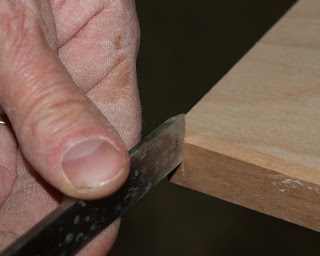 The following photos are of quick hand tool techniques that allow the routing of rabbet joints to be done cleanly and without error. Step one... set up a marking gauge to scribe a line across the grain corres-ponding with the depth of the rabbet. 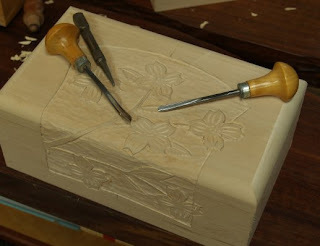 Step 2... place a sharp chisel point into the marking gauge line and strike it with a mallet to make a relief cut. Step 3... Rout carefully as before, but you will get much better results. There is a saying attributed to psych-ologist Abraham Maslow, "If the only tool you have is a hammer, you start treating the whole world as if it is a nail." You can see that it is important that we give our children a variety of tools, including woodworking tools, if we want them to be able to work with sensitivity toward the achievement of quality, both in school and in life. If the only tool you have is a computer, the question becomes, will you treat others and the whole of the natural world as virtual and essentially meaningless?